I recently received a MunchPak in the mail. Talk about a great mail day! There was a little smiling, happy face on the box and it turned out to be quite a terrific mail day. Whenever there are snacks or food involved with my mail it brings me a ton of happiness and joy. MunchPak is a subscription box service that delivers snacks from around the globe to your door each and every month or you can choose to get a box every other week. They have several different options that you can choose from. Keep on reading to find out how you can save a $3.00 off with my special Munchpak coupon code on your first box. There are many ways to customize your box and you can even shop in their online store to choose your snacks. What I love about MunchPak is that it is a fabulous opportunity to try out new snack food products. In my small subscription box, I received six different snacks. You know me, always wanting to try new foods and giving things a whirl. I live for the thrill of this. My soon-to-be 9-year-old daughter Chloe is the same exact way. She came home from school and saw this MunchPak box and it brought a ton of excitement to her day. We took turns opening up the products and trying them out. It was a really great experience with my daughter and it really encourages her to eat with an open mind. Chloe even exclaimed, “these are the best barbeque chips I have ever had”. She had a ton of fun trying these snacks out with me. MunchPak has different options available so you can customize your shipment. They offer three different sized boxes: 5+ snacks, 10+ snacks, and 20+ snacks. Snack boxes start at the low price of $9.95 and currently, all Paks are shipping free of charge. You can also choose your delivery frequency. They have options for delivery every two weeks or once a month. My snack box included six new-to-me international snack foods. There was a mix of sweet and savory snacks in my MunchPak. I have never seen these snacks ever in my life. So imagine my excitement and my surprised face when I opened up my box. The really neat thing about this snack box is that these snacks come from all over the globe. Each snack is labeled with the country that it originated from. As you can see in the photos below there are some pretty unusual countries like Israel and Turkey. I do not ever think to try foods from these countries because their availability in the US is sparse. So this is the wonderful thing about the MunchPak. They bring the snacks to you! Since my daughter and I have been indulging in some not-so-healthy snacks lately we really loved the candies that satisfied our sweet tooth. My favorite candy that was included in my shipment were the Zazers Mixed Fruit Candies. They came from the UK and they were a lot like the Mentos that we have here in the US. They had a really fantastic fruity flavor. The DeeBest Sour Super Dooperz Apple Flavor candies were also a big hit with my daughter and I. We love sour gummies so these sweet little treats were devoured quite quickly! Chloe really loved those Tomahawk BBQ chips. They were our favorite savory snack that was in our MunchPak. Looking for some snacks that are healthy and good for you? MunchPak also offers a subscription box called HealthPak. These boxes contain at least 10 different snacks and all snacks are made with all natural ingredients and are free of GMOs. How does half-indulgent and half-healthy sound to you? MunchPak has a CheatPak available that gives you the best of both worlds. The CheatPak includes at least 10 different snacks from around the world. MunchPak also has an online store where you can shop around and choose your own snacks. The average cost of each snack runs about $2-$5.00. There are a lot of sweet and savory snacks to choose from and it is fun shopping around and deciding on what to get yourself. Would you like to send a gift to a loved one? I am quite sure they would appreciate this box showing up at their doorstep! You can choose the right gift for your loved one on the MunchPak website. MunchPak makes for the most perfect and unexpected gift. 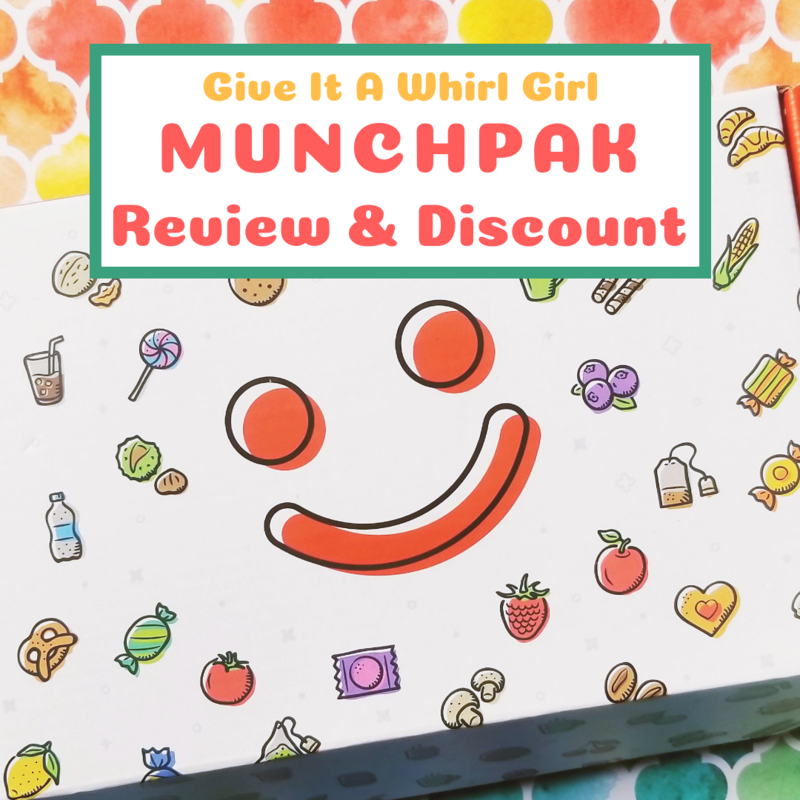 I have a special Munchpak coupon code just for my readers! When you use my special discount code GIVEITAWHIRL you can save $3 off your first box. Heck yeah! I really hope you give this subscription box a try. I don’t think you will be disappointed with this. If you love trying out new foods then MunchPak is the perfect subscription box for you. This is a subscription box service that I can easily see myself being a regular with. I would love to receive a shipment of MunchPak once a month. I am also really curious and intrigued by the HealthPak that they offer. Though the CheatPak might be more fun, the HealthPak for me would be the way to go since I try to lean on the side of healthy eating and lifestyle. I hope this Munchpak review will inspire you to try out these snacks from all around the globe. Have you ever tried any snacks from a different country? Tell me about your experience in the comments. This entry was posted in Product Reviews and tagged candy, cheat day, CheatPak, HealthPak, healthy food, healthy snack, MunchPak, product review, review, snacks, subscription box. Bookmark the permalink. This is such a cool box. I love snacks and trying new items, but with so many things on the market I tend to stick with the tried and true snacks. This would be a fun way to try new items. This is so cool, & definitely something that my daughter would love! She likes trying new foods. We love trying new things. This subscription box looks like a fun one! There’s lots of good looking stuff here. I would like to try the Chik Chak and that is also a nice discount. Although these journey voucher codes are fairly useful, one ought to always undergo a reliable or real web site.